The burning drives and desires of all three fire signs. 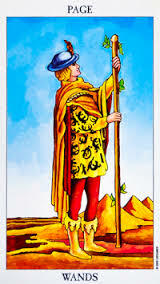 This card is in the journey of life, the seeking for higher values. Greater ambitions and vitality are going hand by hand. Impulsiveness rushing him/her into many directions at the same time can drive the “action taker”. This may come along with their enthusiasm for spiritual development and understanding of the mystical world. The page of wands represents the youthful state we endeavor to find out who we truly are. The page of wands has a very extroverted personality – he/her is passionate about learning and discover the unknown and also goes fast to sexual activity and passionate relationships. This young people are born with greater leadership and want to be “the best” at whatever they do. During the Renaissance they were the youngest member of the court, usually students in charge of carrying news from one person to another one. Creative potential and real intentions to move forward, but more maturity and self-discipline are needed for things to happen. This card can be seen as rebirth and new beginnings. The spirit of the page of wand is one of competition, resourcefulness and creative venture. Love: while you are very into this new relationship, take a moment to see if that reciprocates. Love at first site!